also courtesy of my dad. Wow.. that sure looks good toasty kitten.. do you have a recipe for that? sorry junix. my dad never lets me cook! 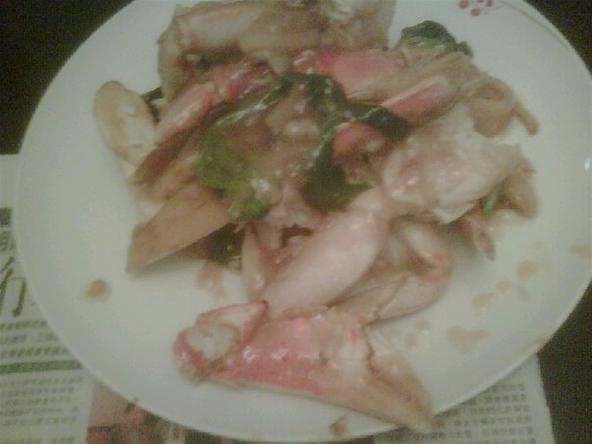 the general recipe is: 1 live crab, ginger, scallions, garlic and fry it in a wok. wok-frying takes some serious skill, which my dad has years of practice at. ah that okay.. are chinese by the way? is that crab meat separated from the shell already? yes i'm chinese. the crab meat is not separated from the shell first. wow...i thought it's already separated because of the pinkish color.. thanks a lot.. toastykitten..